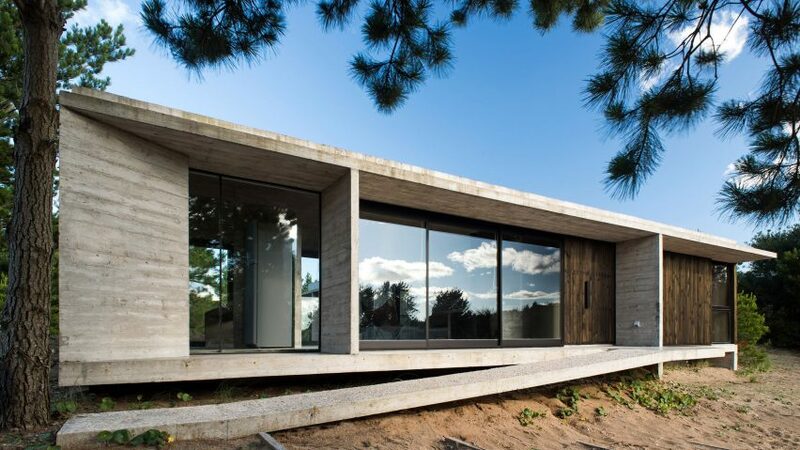 Architect Luciano Kruk's latest board-marked concrete holiday home on the Argentinian coast has walls wrapped in glazing and blackened wood. Equestrian House is a holiday residence located in Costa Esmeralda, a picturesque stretch of coastline 250 miles (400 kilometres) south of Buenos Aires. 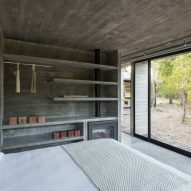 The resort features a number of board-marked concrete residences designed by Kruk's Buenos Aires studio, including his own summer retreat. Kruk designed the latest house for a couple with two children, who asked him to use less concrete than previous designs in order to build it cheaply and quickly. 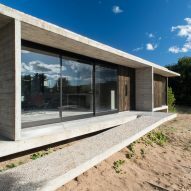 The concrete – which is textured by the imprints of wooden boards and is a popular aesthetic in Argentina – forms the roof, floor and interior walls of the single-storey house. Meanwhile, the exterior walls are made of wood, glass and a metal structure. Vertical concrete fins between the roof and the floor bolster the wall structure, and extend out in front of large windows placed to make the most of forested views. 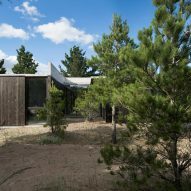 Blackened pine wood clads the rear to provide privacy from neighbours. 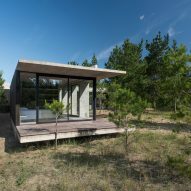 The studio chose the darkened wood and bronze-coloured, anodised aluminium window frames to blend in with the surrounding young forest of acacia and maritime pine trees. Paler wooden details feature inside, along with the exposed board-marked concrete walls. "One of the objectives behind this choice was to create a chromatic contrast between the inside and the outside," said the studio. "On the one hand, kiri wood was used for the former, and on the other, common pine wood treated with burnt oil was used for the latter." 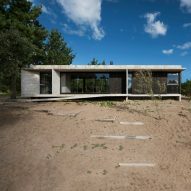 Equestrian House, named after a stable and two polo courses nearby, is set at the top of a shallow dune on the sandy site. Rather than levelling the area, the studio elevated the house on a concrete podium to create a flat base. A ramped concrete pathway leads up the front side of the residence to the main entrance. The house has an L-shaped floor plan that wraps around a central outdoor space and terrace covered in wooden decking that is intended to darken as it weathers over time. The layout divides the house into two wings, with one containing an open-plan lounge, kitchen and dining room. 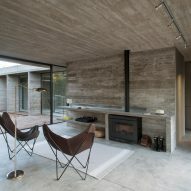 In this space, the dining table and kitchen counter are made out of smooth concrete. 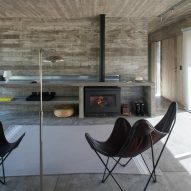 A pair of chairs face a wood-burning stove built into a board-marked concrete volume at the other end of the room, which houses the bathroom inside. The other wing contains the two children's bedrooms and the master suite, with a second external terrace placed between. A room for yoga, an en-suite bathroom, and a private deck are all contained within the couple's bedroom. The wardrobe is made of concrete and features another wood-burning stove.